CGM and Time-in-Range: What Do Diabetes Experts Think About Goals? Information is power. Continuous glucose data can help people with diabetes know what their glucose is doing and how it changes while sleeping, in between meals, and during periods of exercise and stress, etc. In addition, 24/7 real-time CGM can help prevent hypoglycemia in people on insulin and sulfonylureas. Professional CGM worn intermittently can also help people with diabetes work with a healthcare provider to identify patterns, guiding therapy adjustments and changes to food choices. The goal, of course, is to spend more “time-in-range” – 70-180 mg/dl (3.9-10 mmol/l) – each day. Abbott’s FreeStyle Libre was approved in the US (now available in pharmacies) and is in the hands of over 400,000 people around the world. The system does not require any fingersticks for calibration, eliminating a huge source of burden and hassle. Dexcom’s G5 CGM received Medicare reimbursement and has begun shipping to thousands of beneficiaries, following its FDA approval for dosing insulin one year ago. The “AGP” standardized report to view CGM data is becoming more mainstream - it was added to Dexcom Clarity in June, it’s always been in Abbott’s FreeStyle Libre, and we hope to see it come to Medtronic too. We’ll share a follow-up article on why this report is important and how to use it. CGM data is becoming more user-friendly. For example, both Adam and Kelly now get automated weekly email summaries and phone notifications from Dexcom Clarity, sharing their CGM patterns and time-in-range – no downloading or cables required! With all those improvements in mind – and more people wearing CGM – there have been a lot of questions about goals. Specifically, what should time in range be for those of us lucky enough to wear CGM? 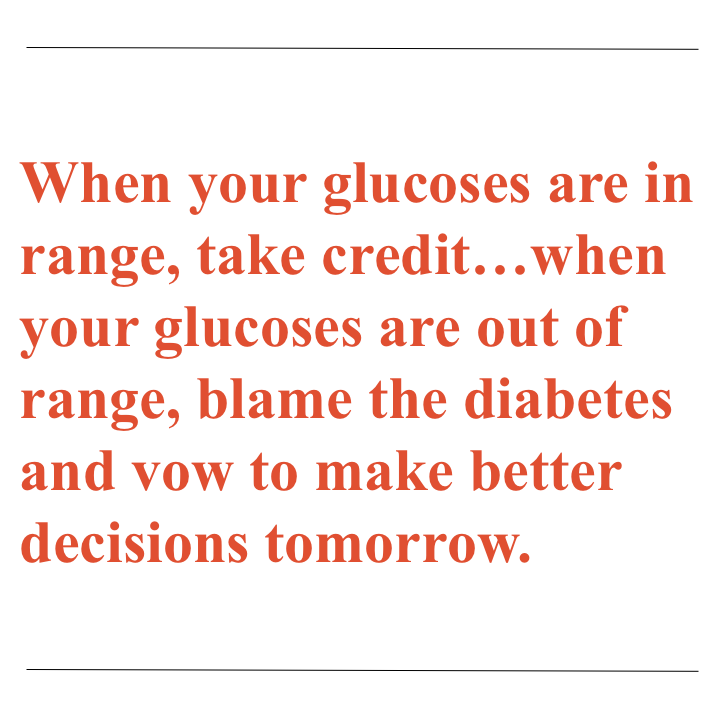 Time in range should be “individualized,” just like all diabetes management should be. Right now, there are no guides to “time in range” that we know of, but this could change over time. Access to new technology and new therapy has a big impact on how well people can manage their diabetes – and thus, how much time they can reasonably spend in range. However, many don’t have access to CGM, which limits their ability to stay in range. Others may have access to CGM, but may still be on older insulins like NPH, making staying in range more challenging. This means setting a single time-in-range “goal” for all patients will be impossible. It’s not just “type 1” vs “type 2,” but also what therapies and technologies someone is using, support at home, levels of stress, what food they have access to, what exercise they can commit to, how much time they have to spend on diabetes, etc. CGM has become much easier and healthcare providers can learn from people with diabetes. Many healthcare providers are increasingly overwhelmed, meaning they often don’t have the time to read about the latest technology or learn how to prescribe it. Others still believe CGM is “inaccurate,” like it was back in the day with the Dexcom STS! CGM has improved tremendously in the past 10 years, and it gets better every year. Click here for updates on Dexcom’s G6, Medtronic’s Guardian Connect, and more. Access to CGM must improve –CGM access has progressed with Dexcom and Medicare, but there are still only an estimated 15% of people with type 1 diabetes on CGM in the US. That is far too low, to say nothing of people with type 2 diabetes. With those points in mind, here’s what some of our diaTribe expert advisors said about time-in-range (70-180 mg/dl) and time-below-range (less than 70 mg/dl) goals. We have just begun this conversation and will be adding more views over time, particularly global opinions. Time-in-range goals depend on the individual. One should try to achieve the highest time-in-range that can be reasonably achieved, but not at the expense of an increase in hypoglycemia. 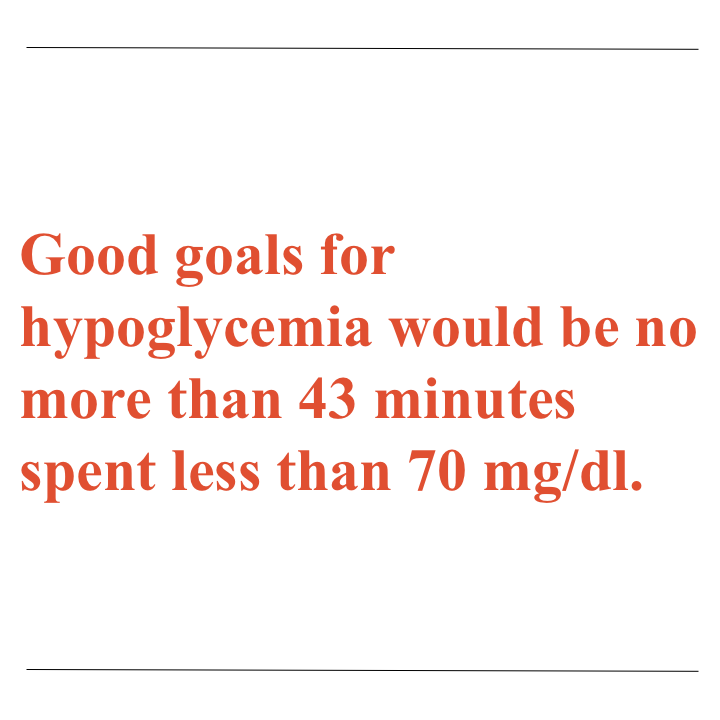 I think good goals for hypoglycemia would be no more than 3% of the day (43 minutes) less than 70 mg/dl and no more than 1% (14 minutes) less than 54 mg/dl. I think it is useful to think about hypoglycemia in minutes rather than as a percent of time – 1% sounds trivial, but 14 minutes below 54 mg/dl doesn’t sound so innocuous. It is important to keep in mind that the population average A1c in people with type 1 diabetes is approximately 8% or higher, and their time-in-range is likely 40%-50%. A goal of 70% time-in-range, or even 60%, is likely unrealistic without drastic changes in their diabetes management approach. On average for a time-in-range of 50%, there is about 45% of the day above 180 mg/dl and 5% of the day below 70 mg/dl. Time-in-range is largely representing hyperglycemia, and improvement in time-in-range is largely due to reduction in hyperglycemia, rather than hypoglycemia. An increase in time-in-range of ten percentage points, where hyperglycemia is reduced, corresponds to a reduction in A1c of 0.5%-0.8% for most individuals with diabetes. A decrease in time-in-range of ten percentage points, where hyperglycemia is increased, corresponds to an increase in A1c of 0.5%-0.8% for most individuals with diabetes. Editor’s Note: We had not realized this A1c/time-in-range relationship, and Dr. Roy Beck told us future publications may explore this issue in further depth. Although we talk a lot about A1c not being “everything,” it is a very accepted metric by regulators, healthcare providers, and payers. Knowing the relationship between time-in-range and A1c could be very helpful for getting time-in-range more accepted as an endpoint, especially for the FDA. Time-in-range data can also be gathered in shorter studies (e.g., two weeks), while A1c endpoints take at least three months. Plus, knowing more about time-in-range and CGM patterns at various times of day is a much more actionable way to improve A1c, in our view. I have just completed my first 10-day experience with FreeStyle Libre and “time in range” takes on a new perspective. As a person with type 2 diabetes, my biggest challenge is not hypoglycemia but the evil CARBS! It is a dramatic discovery to watch the leap up from even a small amount of carbohydrate. I agree that time-in-range must be individualized. 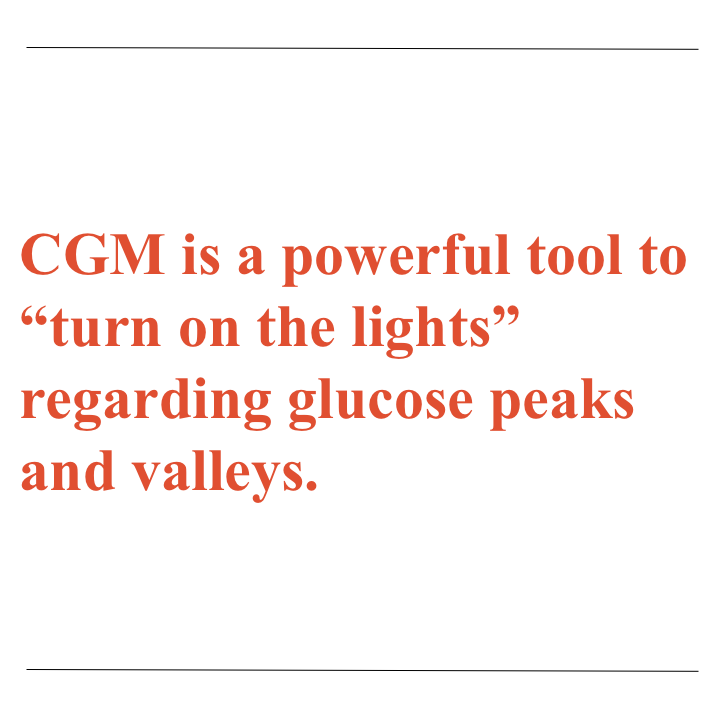 CGM is a powerful tool to “turn on the lights” regarding glucose peaks and valleys, and I think time-in-range is only one of the many powerful pieces of data that CGM provides. This should become the standard of care for everyone with diabetes. I don’t focus on time-in-range, but rather on average CGM glucose and time in hypoglycemia. In my opinion, the goal should be to bring the mean CGM glucose below 154 mg/dl if that can be achieved without excess hypoglycemia. I would agree with Dr. Beck's suggested goals of less than 3% below 70 mg/dl and less than 1% below 54 mg/dl. I can't think of a scenario in which time-in-range tells you anything actionable or independent of the mean glucose and percentage of time in hypoglycemia. 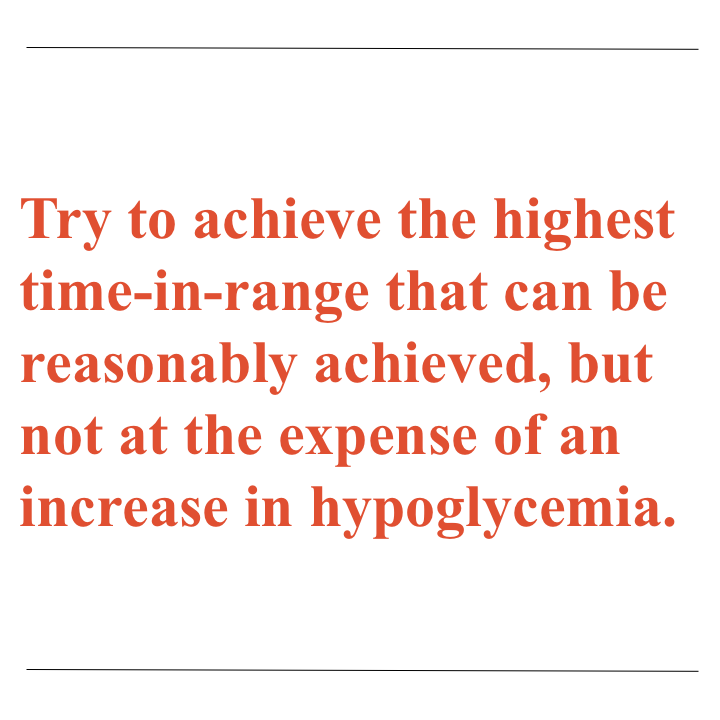 If time-in-range is increased without increasing hypoglycemia, then the mean glucose will also come down – the time-in-range won’t change management. If the mean glucose is reduced at the expense of increased hypoglycemia, then that will be evident from the percentage of time in hypoglycemia – time-in-range adds no actionable information. In contrast to time-in-range, which isn’t correlated with outcomes, mean CGM glucose is tightly correlated with A1c. A1c has a well-known relationship to risk of complications. 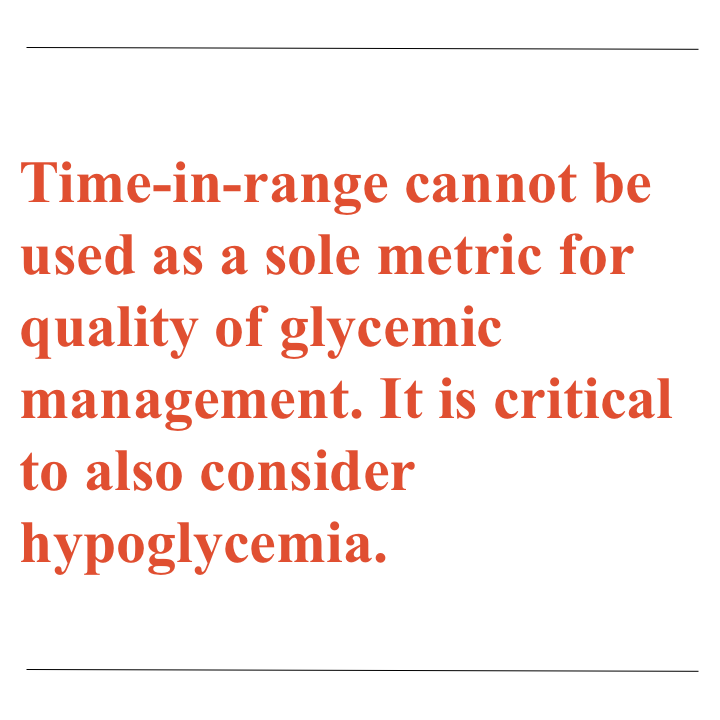 It is possible to increase time in range while simultaneously increasing hypoglycemia, so time-in-range cannot be used as a sole metric for quality of glycemic management. It is critical to also consider hypoglycemia. As long as it is necessary to use two metrics to characterize the quality of glycemic control, it makes much more sense to combine hypoglycemia with mean glucose, which is linked to complications, rather than time-in-range, which is not. Based on these considerations, mean glucose/A1c and time in hypoglycemia are the most important metrics for decision making. A recommendation for a time-in-range target would be a distraction from a more important consideration. Worse, in certain situations, using time-in-range as the key metric for decision making could lead to deterioration in the quality of control. Most experts seem to agree we want time-below-range (under 70 mg/dl) less than 5%. 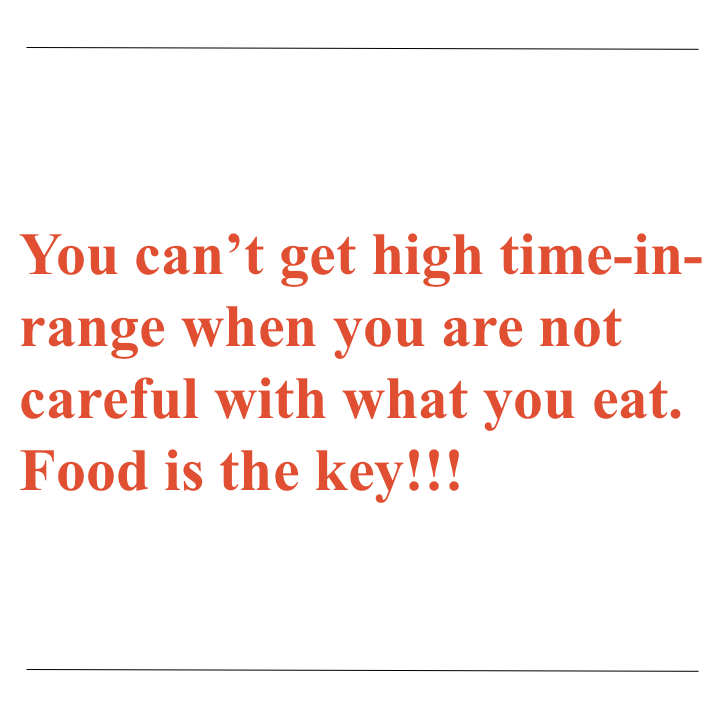 You can’t get high time-in-range when you are not careful with what you eat. Food is the key!!! Giving someone a specific time-in-range target, in my view, may not be beneficial. At least some patients will become OCD trying to get to their target, and in general, putting too much attention into one’s diabetes adds more diabetes burden. The time-below-range of less than 5% is a safety parameter. I like to break down 24 hours of CGM data into time buckets, because a 24-hour time in range is just so daunting. When I see a patient, we look through the reports together, find the problem spots (time buckets), and focus on those. I think the current state of CGM data software and presentation needs to advance to another level. Time in range is good data, but not sufficient data. The “patterns” pointed out by the CGM systems are too elusive, and some folks don’t learn well with graphs. On the patient end, reports or alerts such as “4 out of the past 7 days between hours X and Y, glucose is trending up” would be more helpful than what is available now. Recently I’ve been seeing a greater number of elderly patients starting CGM, and they need concise information. This can help patients take a more manageable proactive approach. When CGM data first became available, it was a contest of “let me show you how smart I am by providing pages of Excel-looking spread sheets.” Thank goodness we are over that. But it's time to get smart again, but this time, PRACTICAL smart. Have real considerations in there for patients and providers. Time in-range is a much better “quality” measure of glucose management than A1c. For most of our type 1 patients, we strive for as much time in-range as possible (70% or more), with as little time below-target as possible (certainly less than 5%). The part that is often overlooked is, “What exactly is the target range?” This needs to be individualized. It is important to balance what is desirable with what is safe and reasonable. Anyone can set a target range of 80-120 mg/dl, but they’re going to be disappointed most of the time because that just isn’t realistic. A common target that we use is 70-160 mg/dl. Above 70 mg/dl, you’re not in a dangerous hypoglycemic range. Below 160 mg/dl, you're not spilling sugar in the urine and becoming dehydrated. However, there is plenty of room for negotiation. For those with good hypoglycemia awareness and regular use of a CGM, we may lower the range slightly. For those starting out with mostly elevated glucose levels, we usually raise and widen the target range. And of course, there are special situations (pregnancy, athletes, very young, advanced age, etc.) that would be greatly helped by even more customization. 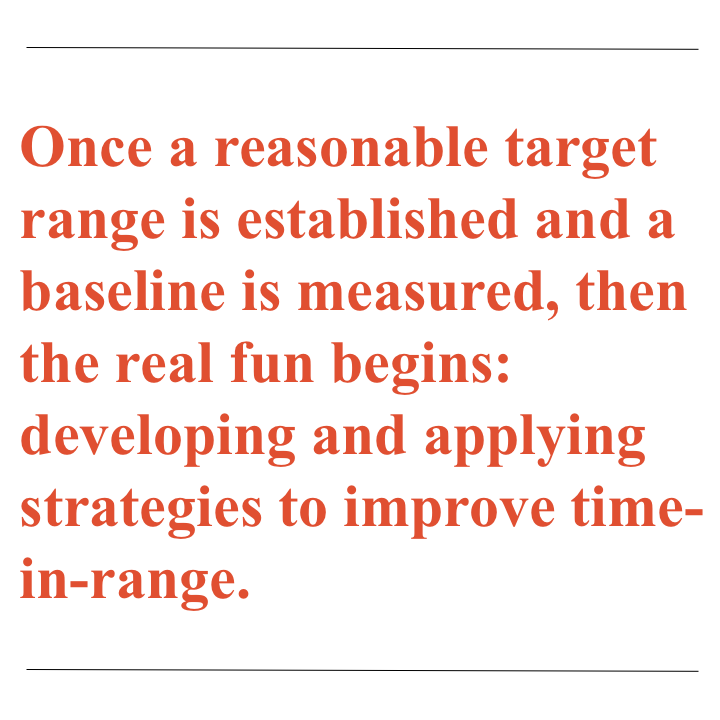 Once a reasonable target range is established and a baseline is measured, then the real fun begins: developing and applying strategies to improve time-in-range. I completely agree that time-in-range (70-180 mg/dl) should be individualized, and I would add that changes in time-in-range over time should be considered (just as we do for A1c). 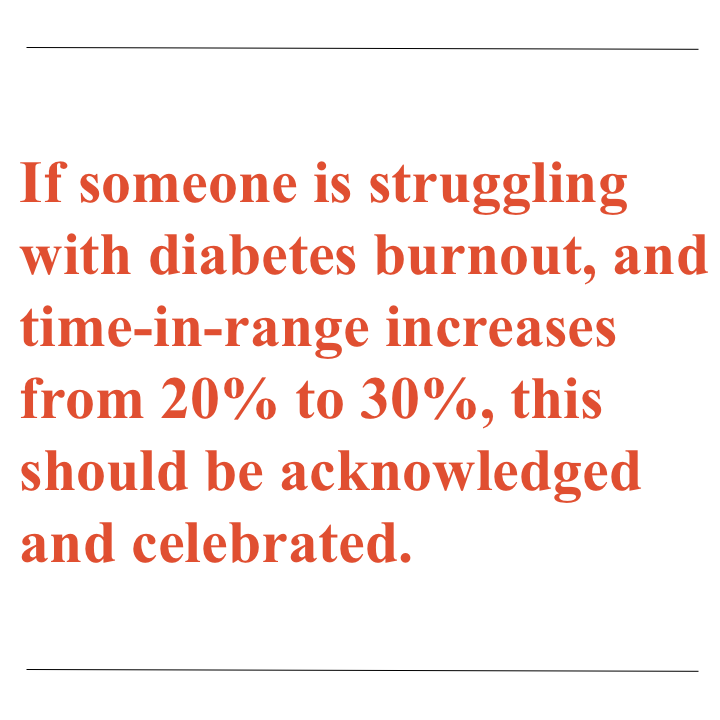 For example, if someone is struggling with diabetes burnout, and time-in-range increases from 20% to 30%, this should be acknowledged and celebrated. In another example, if someone is dialed in on sensor augmented pump therapy with a dynamic approach to diabetes management, they may be able sustain time-in-range over 70%, and with a mindful approach to nutrition (i.e., low carb and/or smart carb) over 80%-90% may be achievable. On the other hand, if time-in-range decreases significantly over time (for example between clinic visits), this may be an indication of a waning honeymoon period, diabetes burnout, or need for a change in diabetes treatment plan depending on the scenario. For time-below-range, I tend to pay even more attention to percent of values less than 54 mg/dl, as this may be an indication of severe hypoglycemia risk. While 3%-5% of values below 70 mg/dl may be acceptable, I become concerned about one’s risk for severe hypoglycemia if the percent of values below 54 mg/dl exceeds 2%-3%. When discussing glucose outcomes, we must be careful about language. CGM metrics are data points to learn from, rather than a pass/fail test. Improvements and success should be celebrated! Conversely, “out-of-range glucoses” or “suboptimal” time-in-range are something to learn from. I’m thrilled that outcomes beyond A1c are increasingly reliable and available thanks to significant improvements in CGM. We’re also seeing higher rates of CGM use among people with diabetes, especially in young children – almost 50% of children under 6 years and 30% of children ages 6-12 in the US are using CGM, according to recent T1D Exchange Registry data. A1c alone simply does not provide the full picture of glycemic control, so additional glucose metrics are paramount. To that end, allowing more patients to have access to CGM is critical. I think time-in-range needs to individualized. I have no doubt that if the population at large can achieve high time in 70-180 mg/dl, the corresponding A1c will be between 6.5%-to-low 7%. For the young and the elderly, the targets should probably be 70-180 mg/dl. For pregnancy, we should aim closer to 70-130 mg/dl. For some patients, we might aim for 70-150 mg/dl. I would be careful in aiming for a much lower range, even though we all know individual patients that have lower targets down to 70-140 mg/dl or even 70-120 mg/dl. I strongly believe preventing hypoglycemia is the key, and if you tighten time-in-range, the risk threshold will be gone. I still have patients on the MiniMed 670G system’s continued access program who would like to tighten the target below 120 mg/dl, despite their A1c below 6.5% with no hypoglycemia. As you know, even if the MiniMed 670G aims at a value of 120 mg/dl, in real life the actual number achieved is much higher closer to 140-150 mg/dl, with an A1c around 7%. Of course, we all know that the current 670G system is more for avoiding hypoglycemia; addressing hyperglycemia (high blood sugars) will be the next step. Just like the A1c, time in range needs to be individualized. There are so many variables to consider, including age, complications, hypoglycemia issues, access to technology, etc. 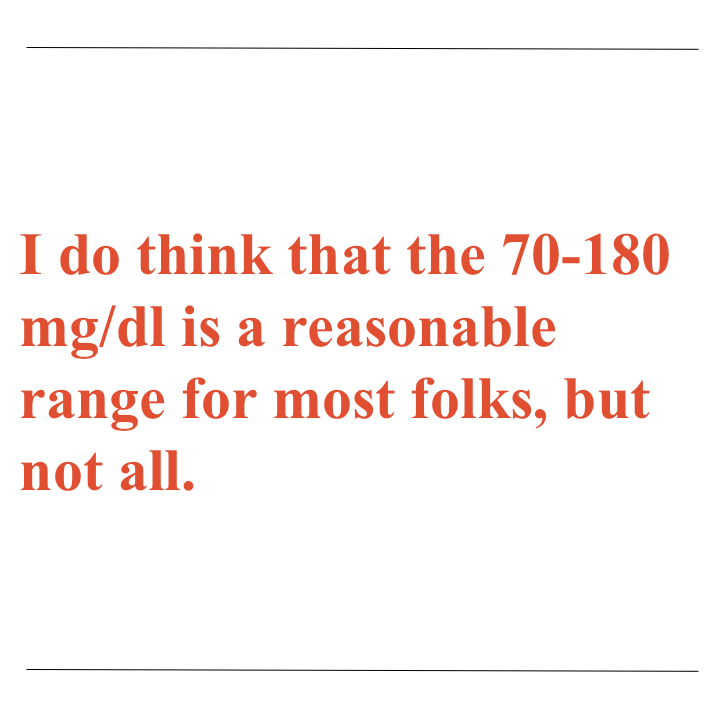 I do think that the 70-180 mg/dl is a reasonable range for most folks, but not all. 70% time-in-range is really excellent, and with a hybrid closed loop, you can get to 80%. With a low carb diet, looking at your trend arrows, taking your insulin early, you could do above 80%. When I look at CGM downloads, I am looking at the average glucose and standard deviation. An average glucose of 150 mg/dl, and a standard deviation of 50 mg/dl, is a decent number for people with type 1, in my experience. Getting a narrow time in range for some folks is extremely hard, particularly depending on what insulin is being used. (Afrezza might help!) I personally feel trend arrows are the single most important part of CGM, and they have a major influence over dosing insulin and non-drug steps to stay in range. 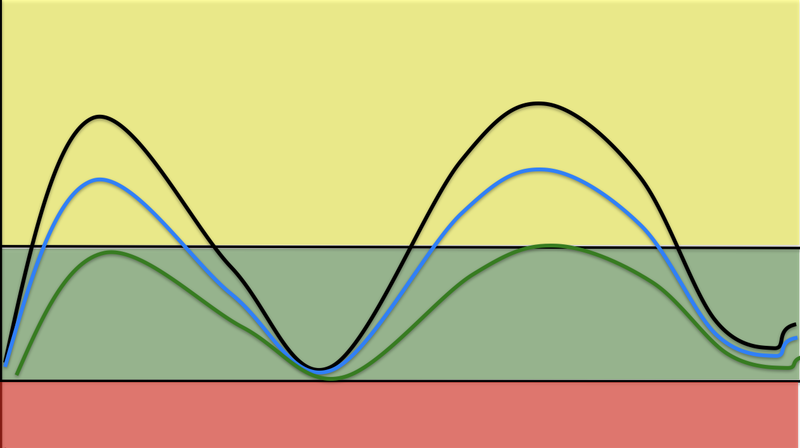 There is no way to stay in range without looking at the trend arrow every time you look at your CGM. Another super important tool to stay in range is the timing of insulin before a meal. Even waiting 20 minutes between injecting and eating can make a huge difference in the after-meal rise and need for correction boluses – all working to improve time in range. Of course, A1c is just an average, and I have seen so many patients with A1c’s that are at target, but the hypoglycemia and fluctuations are out of control. The goal of diabetes management is not only the reduction of hyperglycemia. Ideally it is to restore euglycemia (normal blood sugar) with the least amount of work possible – to restore the physiology that was lost with the development of diabetes. Yes, hyperglycemia as captured with an elevated A1c level is correlated to complications risk – that is well known. However, it is also well known that the main barrier to achieving better glucose levels is hypoglycemia. 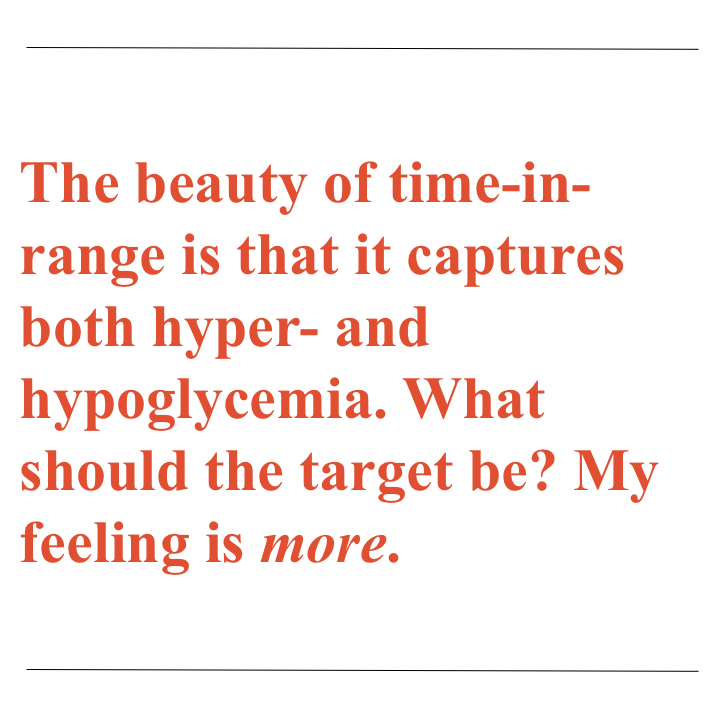 The beauty of time-in-range is that it captures both hyper- and hypoglycemia, and it highlights opportunities to improve BOTH of these challenges of diabetes. What should the target be? My feeling is more. While we are gaining a better understanding of percentages in each range – what is truly achievable for the majority of people with diabetes – we all can strive for a bit better. Tools (devices, drugs, cells) that can reduce both highs and lows and improve time-in-range are going to be winners for people with diabetes. Time-in-range targets and other metrics have to be personalized and may change over time based on what is going on in someone’s life. I’d also emphasize that time-in-range isn’t everything. Even if you had 90% time-in-range, if the remaining 10% was low, it would poor control. So time-in-range has to be interpreted as part of a composite. I love composite metrics like the glucose pentagon. At the present time, over 70% time-in-range is a target that only the most advanced technologies have been able to provide. There has been a progression of improvement in time-in-range with each technology. For CGM + pump (STAR-3), time-in-range was 56%, similar to 57% in the DiaMonD phase that added a pump. With CGM + pump with low glucose suspend (ASPIRE), time-in-range was 62%. With the MiniMed 670G hybrid closed loop, time-in-range was 72%. 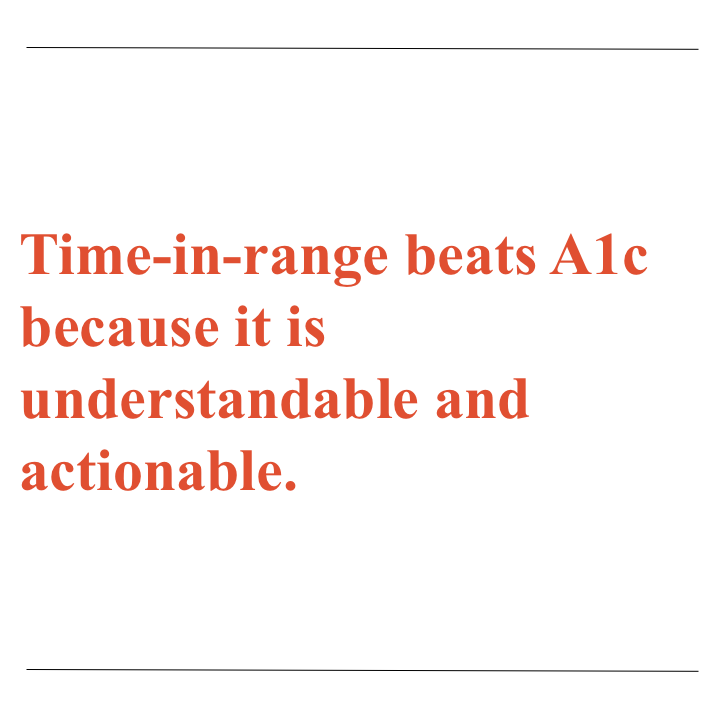 My opinion is that time-in-range beats A1c because it is understandable and actionable. It’s also a much more positive goal to strive for. Attainable time-in-range differs by person (e.g., some patients with diabetes still make some insulin, giving an advantage). It also differs by therapy (insulin type and delivery method). My answer is “better” – the idea is to work together to seize opportunities to improve time-in-range. It’s not easy, but steady progress is the goal. I believe the reason we are now able to discuss time in range is because we have CGM. Recall in the DCCT, as we worked harder to get folks to treatment goal, we had more hypoglycemia. Of course, the patients were doing 4-7 fingersticks daily and rarely had overnight glucose data. With the use of CGM, both the patient and the provider are typically more comfortable with lower blood glucose goals, allowing for more time in range. 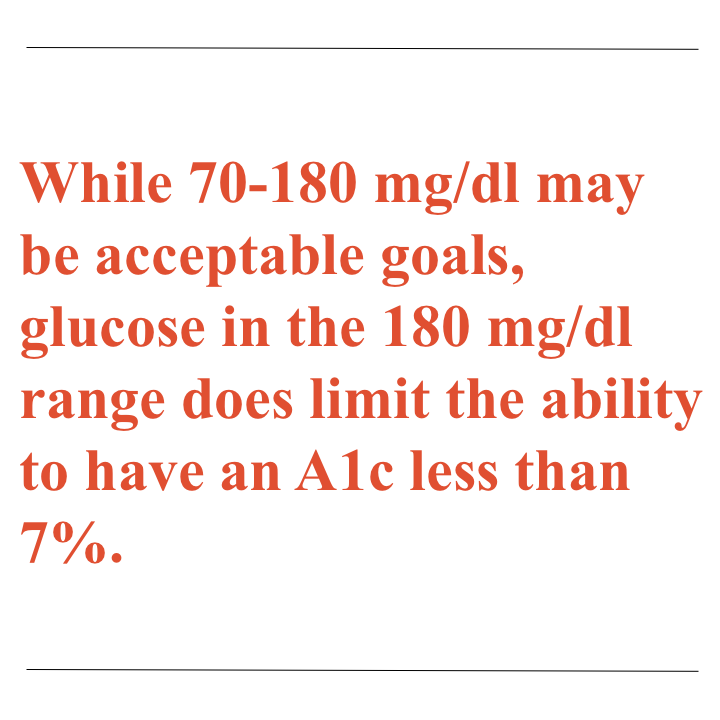 While 70-180 mg/dl may be acceptable goals, glucose in the 180 mg/dl range does limit the ability to have an A1c less than 7%. For the person who does not own personal CGM, occasionally professional CGM will help determine if the A1c (whatever it is) is achieved with glucose in a safe time in range. Time in range is an ideal way to help older people with diabetes manage their diabetes, where the goals can be narrow or liberal based on overall life goals. In my practice, healthy older adults in their late 80’s can still manage to keep a goal of time in range between 90-180 mg/dl, while a similar-age patient in a nursing home with limited life expectancy, can do well with a goal of time in range between 100-250 mg/dl – simply preventing severe hypoglycemia and hyperglycemia. Unlike A1c, time-in-range as a goal provides both the patient and the clinicians with a way to individualize goals that is not possible with A1c alone. We have gained a lot of ground in diabetes management while using A1c as a goal to prevent complications. However, the availability of CGM has shown the limitation of trying to correlate average glucose and A1c. Particularly in the older population, factors that impact red blood cell turnover, and thus, A1C measurement, are commonly seen – and yet goals continue to be set in the context of A1c alone. In addition, the older population is heterogeneous, has different goals based on their overall health, and need to continually change their glycemic goals based on their health status. A1c as a sole marker of glycemic control is inadequate and sometimes dangerous for this population when followed singularly. Please send us your opinions on time-in-range!